Bog Sage | Beautiful Flowers, Easy-to-Grow and You Don't Need a Bog! Bog Sage - Easy-to-Grow With Beautiful Flowers, and You Don't Need a Bog! Of all the different varieties of the lovely herb we call sage, you have to agree that poor old bog sage, or salvia uliginosa, seems to have gotten the short end of the stick when it came to names. But don’t judge the plant by its name, it's a lovely perennial, which is both fragrant and a wonderful addition to any garden. The plant gets its unfortunate name from a botanist who discovered this variety of sage in South America. He found it in swampy areas, so called it “uliginosa” to refer to its natural habitat of marshes and swamps. One of the best reasons to consider bog for your garden is that it grows quickly and easily. The plant resembles bamboo, growing three feet and up to six feet high within one season, with a bushy base of up to three feet wide. Bog has many thin stems and small light green pointed leaves with ragged edges. 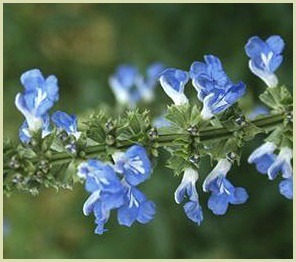 Its flowers are small, roughly half an inch in size, and they are a beautiful shade of azure blue with white highlights. Many flowers blossom at the same time, creating a magnificent visual display. You’ll start to see flowers in the mid-to late summer, and you’ll find it will attract lots of pretty butterflies and hummingbirds to your garden. Bog also spreads easily along the ground, and is simple to divide. You can take cuttings from the mature plant all summer long if you want to share with friends. You also shouldn’t be put off by the name when it comes to growing it! You do not need to have a bog in your back yard, or even a damp garden, to successfully grow this pretty herb. Bog sage tolerates both cold and extreme heat, which makes it easy to grow just about anywhere. Plant your seeds or purchased plants in the spring. The best place for your bog plant is in full sun with well-drained soil, where it will get lots of water. It can tolerate partial shade, but it will grow better in a fully sunny spot. If you find the right place, it can bloom summer long if you take time to do a little deadheading. Cut back to the ground after the last blooms of the season, add a light fertilizer on new growth in the spring, and you’ll see wonderful blooms year after year. Note: If you would like to grow culinary sage, click here for tips.